How very true, Robert san! Reading about Yugen will give the reader an idea, but not the full reality of it. Just like reading about food will give you an idea, but your stomach will still be empty. Reading a translation will not give you the real ... depth, truth, beauty, words fail me here ... of a Japansee haiku. Being exposed to Japanes culture on a daily level for 30 years, still, the concept of yuugen is far from grasped. And I studied quite a bit about Noh Drama, Kamakura had a Noh stage (noobutai 能舞台) with excellent performances. Yugen is a difficult concept. Several whole volumes in Japanese are devoted to this word, particularly in relation to the 'noo' drama. Yūgen is an important concept in traditional Japanese aesthetics. The exact translation of the word depends on the context. 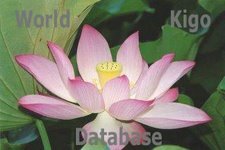 In the Chinese philosophical texts the term was taken from, yuugen meant "dim", "deep" or "mysterious". In the criticism of Japanese waka poetry, it was used to describe the subtle profundity of things that are only vaguely suggested by the poems, and was also the name of a style of poetry (one of the ten orthodox styles delineated by Fujiwara no Teika in his treatises). In the treatises on the Noh theatre by Zeami Motokiyo it refers to the grace and elegance of the dress and behaviour of court ladies. It is expressed in art, especially in the Noh drama, by an effortless artistry which is achieved when the essence, the core of the action or thing to be expressed, is reached, and the consequent expression, as a result, reflects the deepest, most profound meaning. The more the art of haiku or Noh is mastered, the greater the likelihood of expressing 'yugen'; likewise, the more an experiencer understands the art, the greater the possibility of experiencing 'yugen' in a work of art. Photos of YUUGEN scenes of Japan ! The sarugaku Noh troupe Yuzaki, led by Kan’ami, performed in 1374 before the young shogun Ashikaga Yoshimitsu (足利 義満). The success of this one performance and the resultant shogunal patronage lifted the art form permanently out of the mists of its plebeian past. From then, the term sarugaku gave way to the current nomenclature, Noh.
. Imakumano Jinja 新熊野神社 Imakumano Shrine . The title of this book is exquisite, while the cover illustration is of something else, different yet just as exquisite. This is appropriate because the aesthetic concept that the book considers is not just beautiful, but elusive and difficult to define. Returning then to the origins of the concept, in China and Chinese characters, he confirms the elusiveness of the idea: something ineffable, remote and because of its remoteness, subtle, hazy, hard to put in words, even if it is recognizable to those who understand. Its most immediate association is with noh drama, which is not dramatic. The costumes of noh, as Sato rightly says, are richly patterned brocade, colorful and costly, which seems to belie the faint effects hankered after here. But the drama is also poetic, and therein can be found clues to the aesthetic quality that the term “yugen” encapsulates. There is little or no action in a noh play, and whatever slight happening occurs is a late reverberation of something else that took place a long time before. Is yugen, then, a longing, a memory, a dream? It began to be defined around the 10th century, in poems that Sato includes, and yet, while natural imagery may suggest it, it remains “an overtone that doesn’t manifest itself in words.” For some, the bright shade of cherry blossom is its antithesis, though the great dramatist of noh, Zeami Motokiyo, used this very term, “hana” (flower), to describe it. The qualities ascribed to yugen blur later into others like wabi and sabi (loneliness and desolation), or omokage (suggestiveness), all of which Sato evokes in his discussion. It can be found in fading, emptiness, even the color white, while it may also sometimes be filled with a lost, or even nascent, expectation. In the practice of noh all these converge. The qualities that poetry develops there combine with stories about the poets, or else tales of the characters, particularly unhappy women, in “The Tale of Genji,” to provide subjects for the masked drama of noh. Sato details much of this later in the book, and adds some illustrations, the last of them the ¥2,000 bill issued to commemorate the Group of Eight conference in Okinawa, and now elusive, too. Occasional references in the book to South American poets reminded me of the Spanish concept of duende, which is darker, tragic, and essentially conceived as black. But it shares with yugen a sense of touching some essential spirit, conveyed in the performance of an art (dance, music, poetry) that cannot be explained in black and white. This is an engaging little volume, the fruit of long consideration. Ambiguity and yugen (depth and mystery) are wonderful tools. Most good haiku have more than one level of meaning. should not be mixed up with riddles and overly mystical, metaphysical, philosophical or other mental statements. Creating depth should not lead to creating confusion on purpose. Read more on this problem HERE ! Yugen and shasei, sketching from nature, are not contradictions, but can go very well together. A moment of really experienced yuugen can still be rendered by giving a simple description of the scene. The frog just jumped in the old pond, he did not jump "through me". of surface simplicity, only then, when the conception is exalted to the highest degree and "the words are too few," will the poem, by expressing one's feelings in this way, have the power of moving Heaven and Earth within the brief confines of a mere thirty-one syllables, and be capable of softening the hearts of gods and demons. Japanese author, poet (waka), and essayist.
. Kamo no Choomei 鴨長明 Kamo no Chomei . The Tipster Sprite (Shojo) is a play built upon very auspicious words. It takes place in a village on the Yangtze in China. An sprite (shite) who lives in the sea comes before a man named Gao-feng (waki), a wine seller with much filial piety. The sprite gets drunk and enjoys himself by dancing, after which, the man learns that he has received a blessing: no matter how much wine he dips out of the vat, it never runs dry. Copyright 2004, by the Japan Arts Council. Legends about plants communicating with humans were quite common. Other plants were the Willow Tree, Plum Blossoms, Fuji Wisteria and Yanagi. A monk teaches the spirit of the Banana plant, that women may also attain Buddhahood. Written by Konparu Zenchiku 金春禅竹 (1405 - 1470). 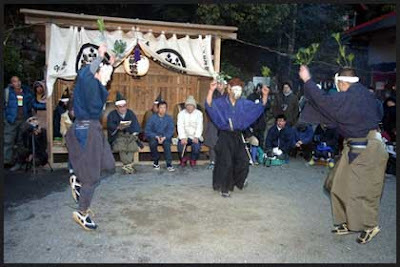 yonoo 夜能 (よのう) "night Noh"
..... goen no noo 後宴の能（ごえんののう） "Noh after the Feast"
The main festival of the Kasuga Wakamiya shrine lasts from December 15 to 17. 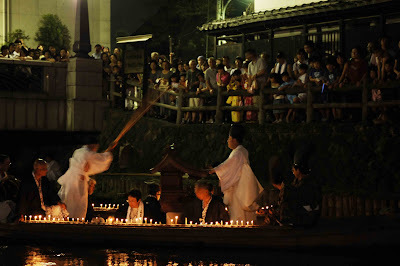 On the night after the festival, a ritual Noh is performed by the Konbaru family of Noh　金春流 (Konparu). Before the performance, a ritual feast is held, and after that, a time of abstinence comes.
. Kurokawa Noh at Yamagata . This Noh drama has been performed for 500 years as a dedication to Kasuga Shrine, the tutelary shrine of Kurokawa. The main difference between this Noh drama and other forms of Noh is that it was not a sophisticated drama performed for people of the samurai class. 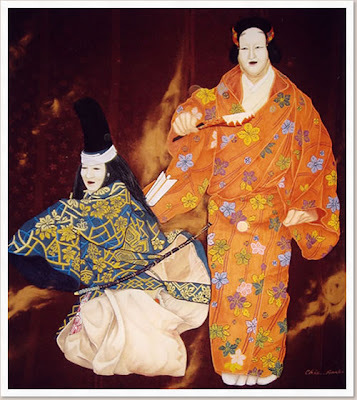 In fact, Kurokawa Noh was traditionally a drama form beloved and enacted by farmers. There are further differences to other Noh, such as the separation of seats. At present, Kurokawa Noh is performed by about 160 actors, and has 230 masks, 400 typical Noh costumes, as well as 540 repertoires and Kyogen numbers. On the 18th and 19th of the first lunar month. With a prayer for a good harvest, peaceful life and happy family. Also to ward off disaster from floods and fire. There are 47 different dances, most use masks (kamen no mai　仮面の舞). this performance, like the Kurokawa Noh, has a lot of the yuugen quality of a Noh performance. (しょうじょうばかま) lit. "Tipster Sprite hakama"
yoin, yo-in, yo in　余韻 "reverberation"
The cut takes it away, but the YOIN remains in a haiku. A haiku which is stuffed too much has little left in there to impress you. Omission is the soul of haiku. It contains the whole universe in 17 syllables. An implied message born from omission is vitally indispensable to haiku. An implied message or, yo-in 余韻, is what you infer from what is expressed in words.
. Noh and Matsuo Basho . For his hokku about a Noh mask, see comment below. The 8th day of the 8th lunar month. and the day has dawned. Read more about Zeami in the wikipedia link, see comments. —derived from the Sino-Japanese word for "skill" or "talent"—is a major form of classical Japanese musical drama that has been performed since the 14th century. 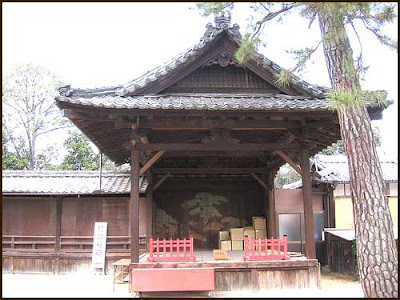 Developed by Kan'ami and his son Zeami, it is the oldest major theatre art still regularly performed today. 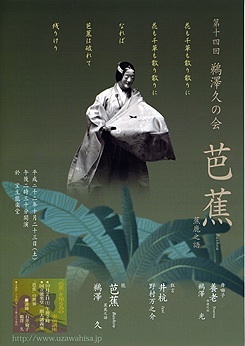 Traditionally, a Noh program includes five Noh plays with comedic kyōgen plays in between, even though an abbreviated program of two Noh plays and one kyōgen piece has become common in Noh presentations today. An okina (翁) play may be presented in the very beginning especially during New Years, holidays, and other special occasions. During the Tokugawa era Noh continued to be aristocratic art form supported by the shogun, the feudal lords (daimyo), as well as wealthy and sophisticated commoners. While kabuki and joruri popular to the middle class focused on new and experimental entertainment, Noh strived to preserve its established high standards and historic authenticity and remained mostly unchanged throughout the era. To capture the essence of performances given by great masters, every detail in movements and positions was reproduced by others, generally resulting in an increasingly slow, ceremonial tempo over time.
. bakufu 幕府 The Edo Government and Administration .
. Observances, festivals, rituals - SAIJIKI . Zeami (1363-1443), Japan's most celebrated actor and playwright, composed more than thirty of the finest plays of no drama. He also wrote a variety of texts on theater and performance that have, until now, been only partially available in English. Zeami: Performance Notes presents the full range of Zeami's critical thought on this subject, which focused on the aesthetic values of no and its antecedents, the techniques of playwriting, the place of allusion, the training of actors, the importance of patronage, and the relationship between performance and broader intellectual and critical concerns. 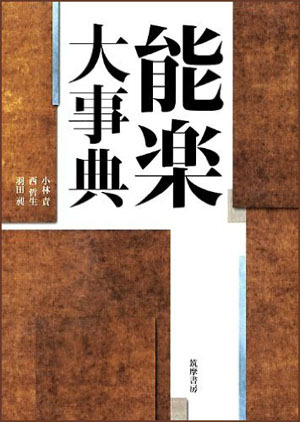 Spanning over four decades, the texts reflect the essence of Zeami's instruction under his famous father, the actor Kannami, and the value of his long and challenging career in medieval Japanese theater. 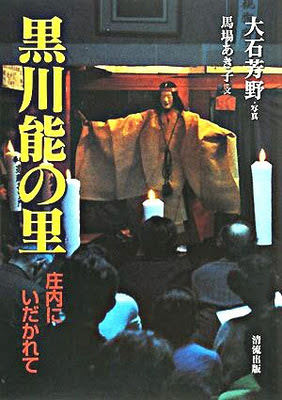 Tom Hare, who has conducted extensive studies of no academically and on stage, begins with a comprehensive introduction that discusses Zeami's critical importance in Japanese culture. He then incorporates essays on the performance of no in medieval Japan and the remarkable story of the transmission and reproduction of Zeami's manuscripts over the past six centuries. His eloquent translation is fully annotated and includes Zeami's diverse and exquisite anthology of dramatic songs, Five Sorts of Singing, presented both in English and in the original Japanese. was a Japanese aesthetician, actor, and playwright. His father, Kanami, introduced him to Noh theater performance at a young age, and found that he was a skilled actor. As the family theater troupe grew in popularity, Zeami had the opportunity to perform in front of the Shogun Ashikaga Yoshimitsu. The Shogun was impressed with by the young actor and began a relationship with him. Zeami was introduced to Yoshimitsu's court and was provided with an education in Classical Literature and Philosophy while continuing to act. In 1374, Zeami received patronage and made acting his career. After the death of his father in 1385, he led the family troupe, a role in which he found greater success. Basho visited the home of the Noh actor Honma Shume 本間主馬. The Noh mask has holes in the nose part for the actor to see just a little bit in front below him. So the fragrance indeed comes through the nose for him to see. A simple man like Basho can only feel the fragrance with his nose. Activities of UDAKA Michishige and his sons, Tatsushige and Norishige undertaken and supported by the Udaka Michishige-no-kai. Noh performances, lectures, hands-on seminars and training programs to popularize Noh and encourage an understanding and appreciation of all its aspects, developing the skills of young Noh performers, are among these activities. Founded in 1984, the International Noh Institute offers training in chant (utai), dance and mimetic movement (shimai), and mask carving with Udaka Michishige, Master-actor of the Kongō School of Noh and master Noh mask carver. Since then, Michishige has taught students from all walks of life: actors, dancers, designers, mask makers, musicians, psychologists and scholars, from all over the world through INI programs. Kappa mask for the Noh Theater. a review by Patrick Schwemmer. That so little is known overseas about the most refined masks in the world, that their great beauty has received almost no recognition, prompted me to write this book’ (p. x) – so Stephen Marvin introduces the first book on Noh masks in English and a major contribution to the fields of Noh studies and art history. Volume I is a monograph relating the history, manufacture, usage, typology, authorship, connoisseurship, storage and display conventions of Noh masks, in enough detail and with enough accuracy to give a sense of the contours of the subject. What More Do We Need to Know about the Nō? In one of the more remarkable public events of the Tokugawa world, the shogun responded to a deepening crisis in the 1840s by sponsoring a huge, "once-in-a-generation" noh performance-- the largest performance ever held. This is the first Western language book on Edo period noh and its use by the shogun, an essential addition to the scholarship on Japanese theater and the cultural history of early modern Japan. Introducing the world of Noh"
The demon masks kishin 鬼神: Tobide 飛出 portraying demons or savages, and 癋見 / 閉歯見 Beshimi portraying goblins such as Tengu. beshimi means mouth clamped firmly shut. Tobide portraying demons or savages, and Beshimi portraying goblins such as Tengu.